WE admit it. We are behind on our hound posts. But it’s not for lack of working. 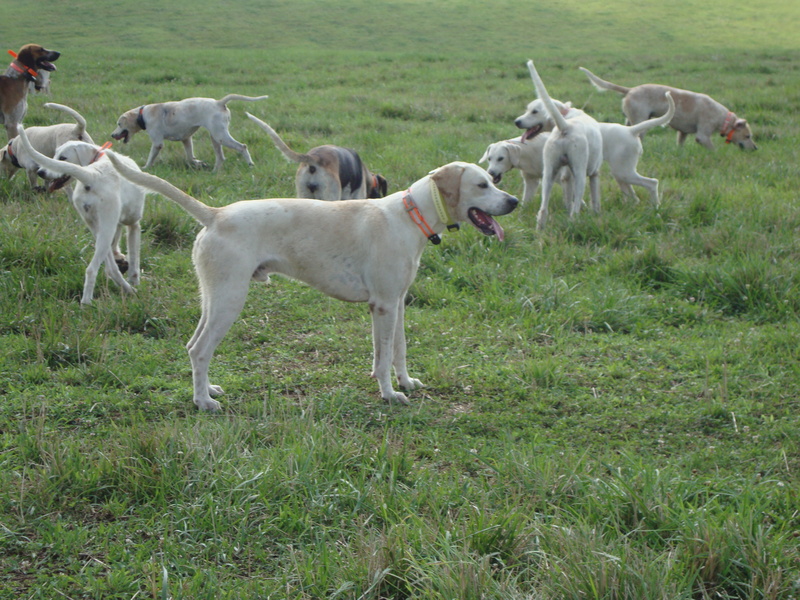 The houndbloggers have been collecting video footage of the hounds at work and also recently attended the Lives of Dogs symposium at the National Sporting Library, which featured speakers (including noted hound man Ben Hardaway) on a variety of foxhound-related topics. We’ve been asked not to share video footage of that event online, though as we understand it DVDs will be available from the NSL via inter-library loan. 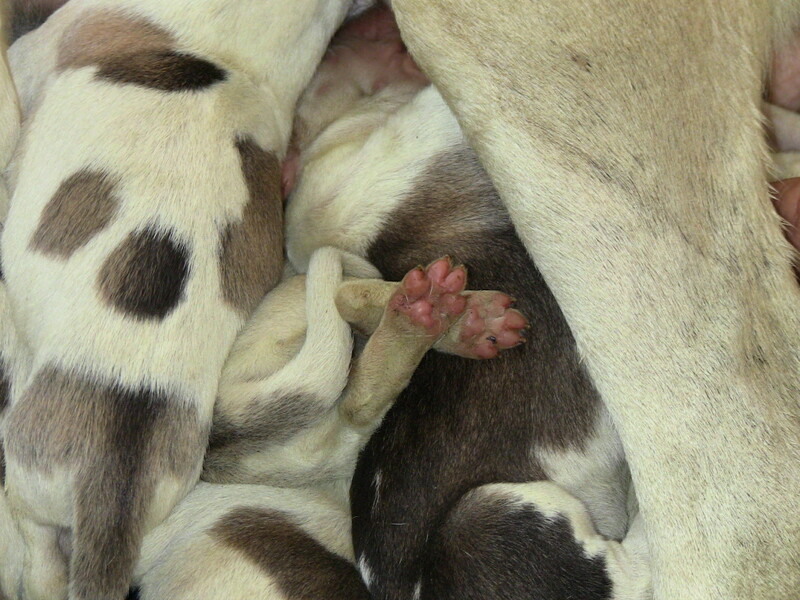 But we are writing up our coverage of several of the speakers whose topics most related to hounds, and we hope to have that posted in the next few days, probably over the weekend. We’re also busy working away on a longer video of some highlights from the cubbing season, which ends when the formal season begins on the first Saturday of November with the Blessing of the Hounds. While you’re waiting for those, we’d like to introduce you to Flash, our new Canon high-definition camcorder, which is pretty wow. Or at least we think so. Flash the HD camera made his debut this morning at the Boone Valley meet, where the scenery is spectacular and nature further obliged with a little romantic fog. You can see the results in the video above. Because this HD camera does not have as much zoom capability as our older Panasonic non-HD camcorder, we’ll continue to use the Panasonic (aptly nicknamed Zoom, for those of you who are keeping track of such things) for videoing any distant hound work we happen to be in position to see. But for the closer stuff, we’ll try to stick to HD as much as possible. 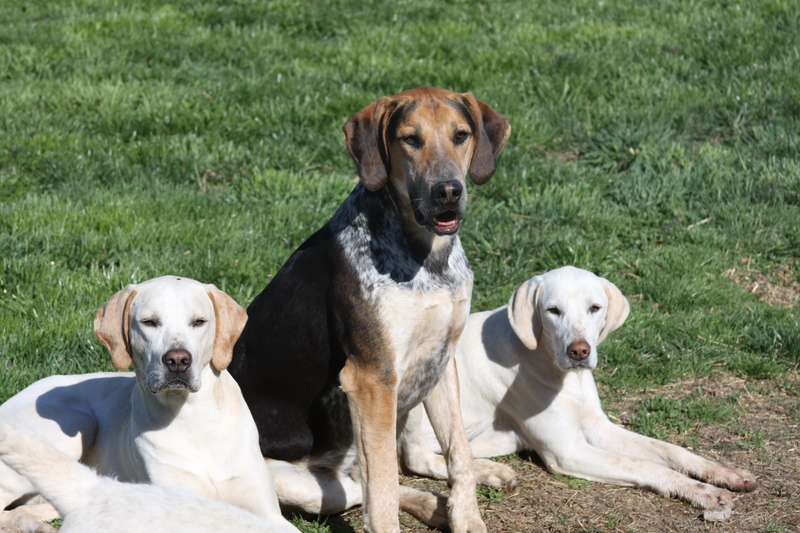 THIS week the houndbloggers have been hosting Gina Spadafori, an influential author and blogger on dog and companion-animal subjects and the writing partner of “America’s Veterinarian,” Dr. Marty Becker. 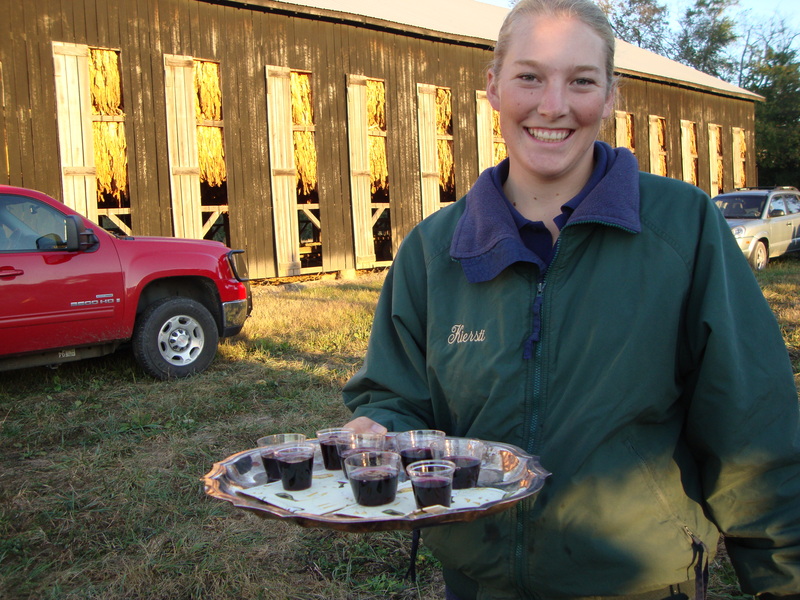 She’s also a breeder and owner of flat-coated retrievers and strongly supports letting working breeds do the jobs they were bred to do. Which led her to the Iroquois kennel. 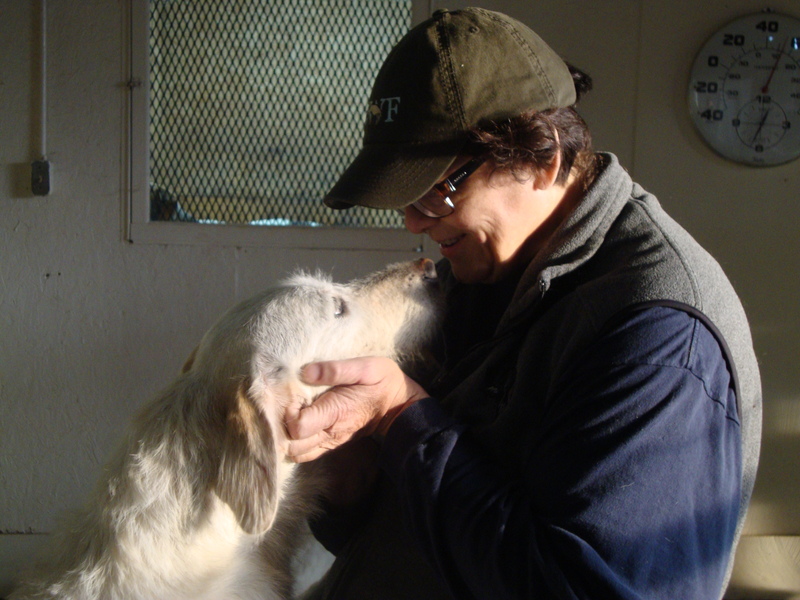 She visited the kennel on Tuesday and had some interesting observations about our hounds’ lives there. 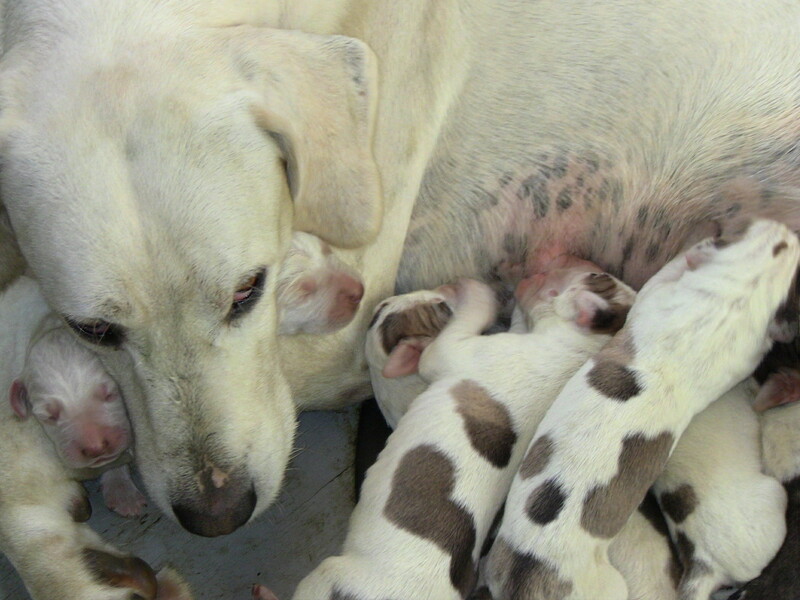 If you think kennels sound dreary, you might be especially interested in Gina’s perspective on how dogs–in our case, working pack hounds–can live happily in kennels. To read the piece, click on over to Pet Connection. 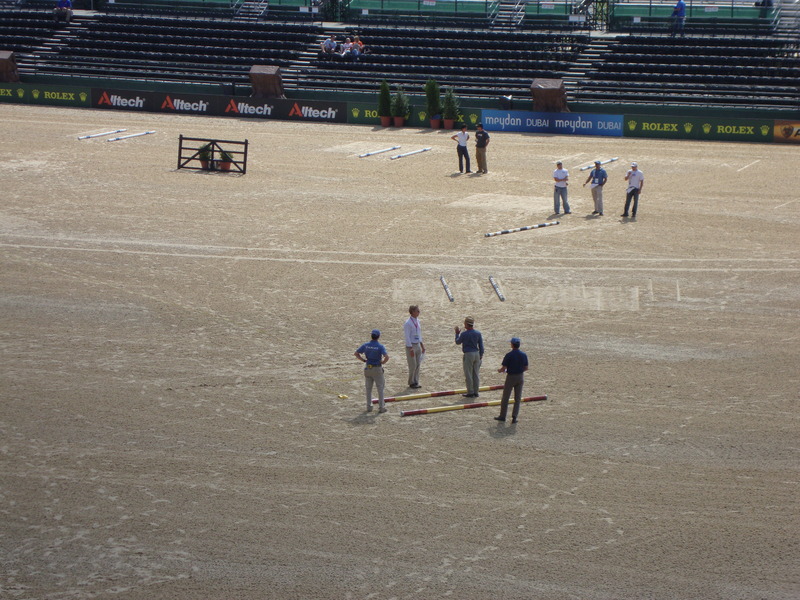 THE houndbloggers learned a few things at the recent World Equestrian Games. The two lessons that will stick with us longest are 1) Dippin’ Dots are not to be touched with a ten-foot pole, let alone a spoon that you intend to put in your actual mouth and 2) the driving marathon is one of the most exciting, challenging, and cool-looking things you can do with a horse (or four). Let’s jump right in with the driving marathon, because we know there are some readers out there who were curious to see what it looked like. 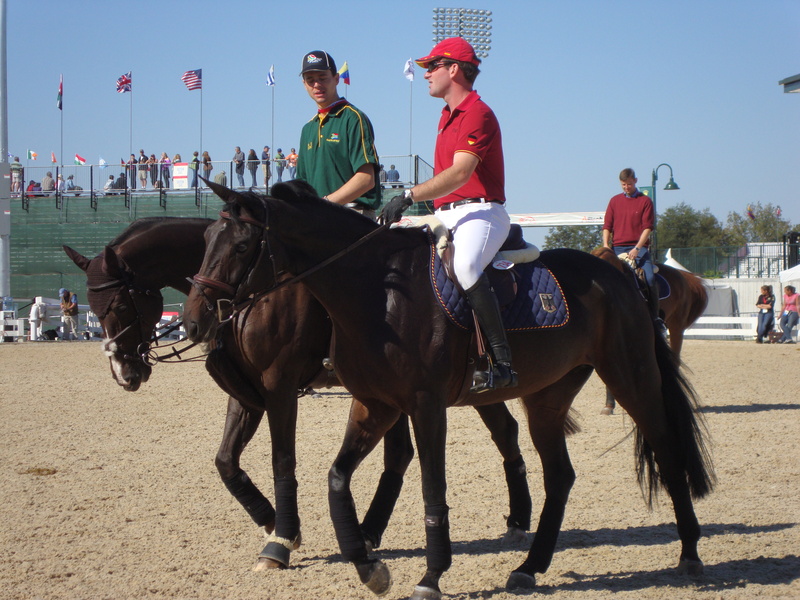 The driving competition is modeled on three-day eventing, and, like eventing, has three basic components: dressage, cross-country, and stadium. 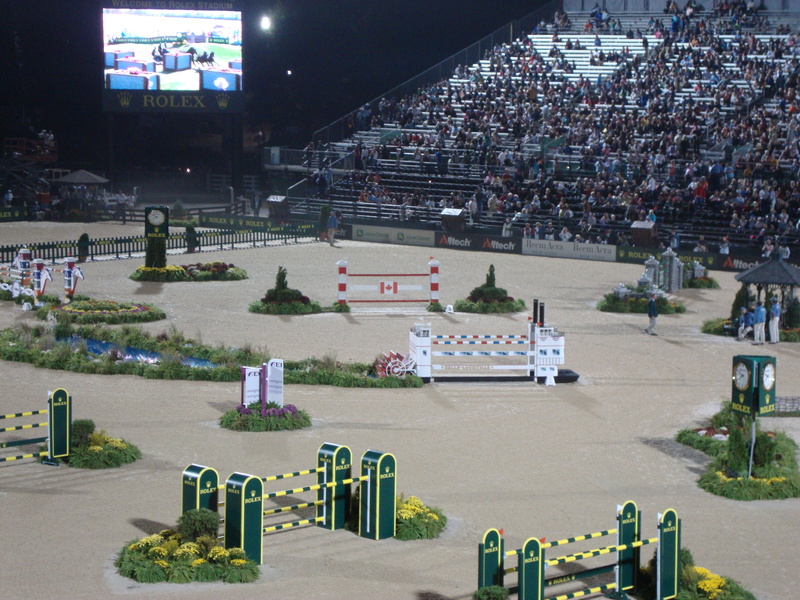 Now, obviously, there’s no jumping when you have four horses pulling a carriage, so the cross-country and stadium phases are different from the eventing competition in that regard. 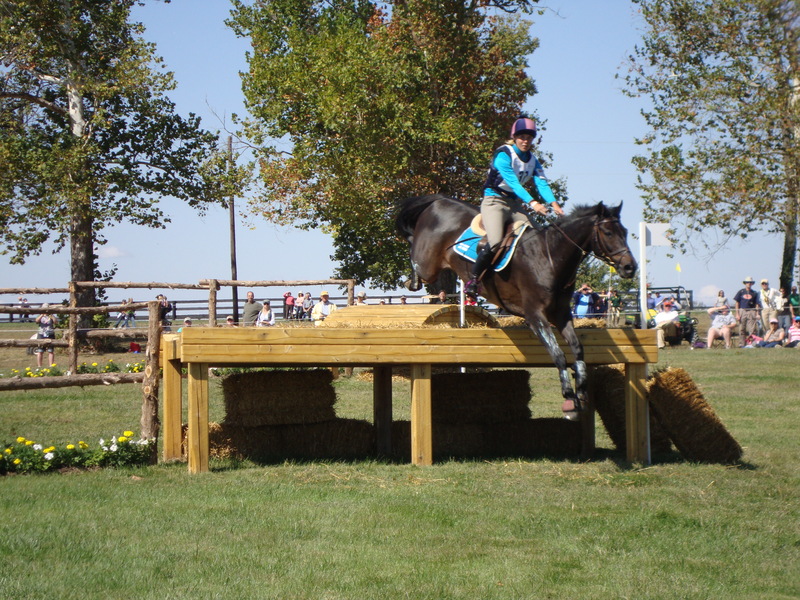 Instead of cross-country fences, there are hazards that feature a number of gates the horses have to go through (and, as in cross-country riding competition, there’s more than one way through each obstacle). 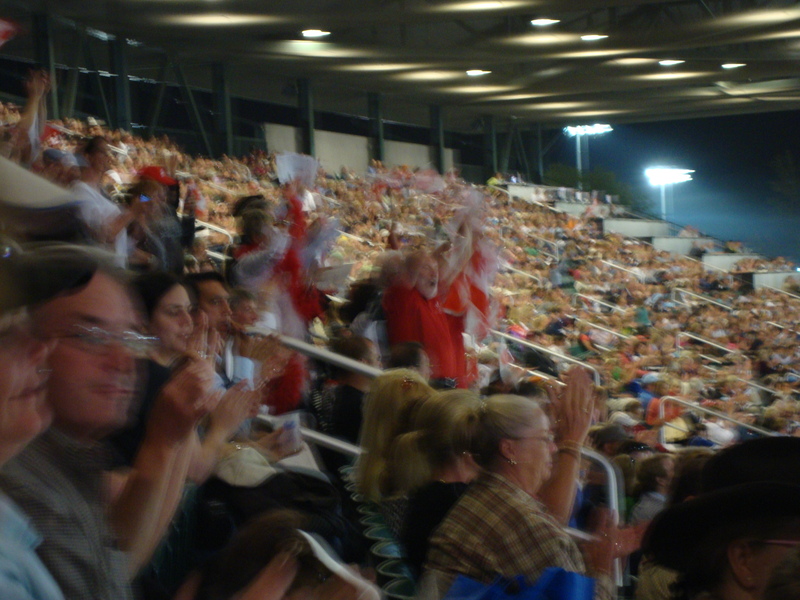 Instead of stadium fences, there is a set pattern of traffic cones through which the horses must go. 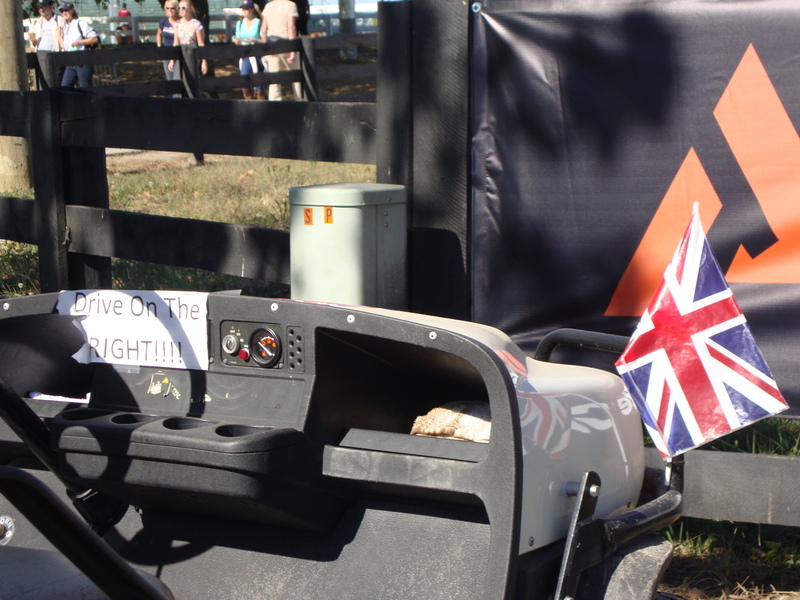 The houndbloggers attended only one of the driving events, but it was the one we most wanted to see: cross-country. Here’s a taste. 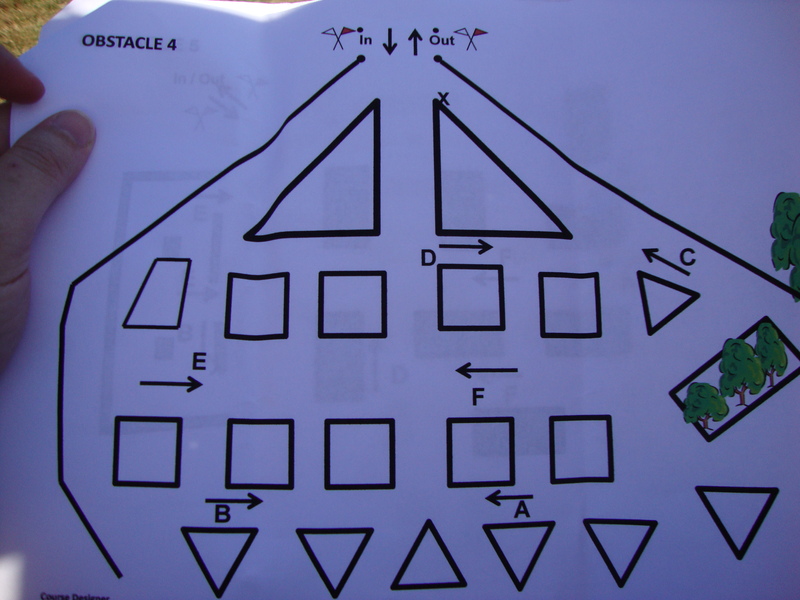 This video was from the sidelines as a couple of competitors negotiated Obstacle 4, named Walnut Hill, where not everything went as planned. 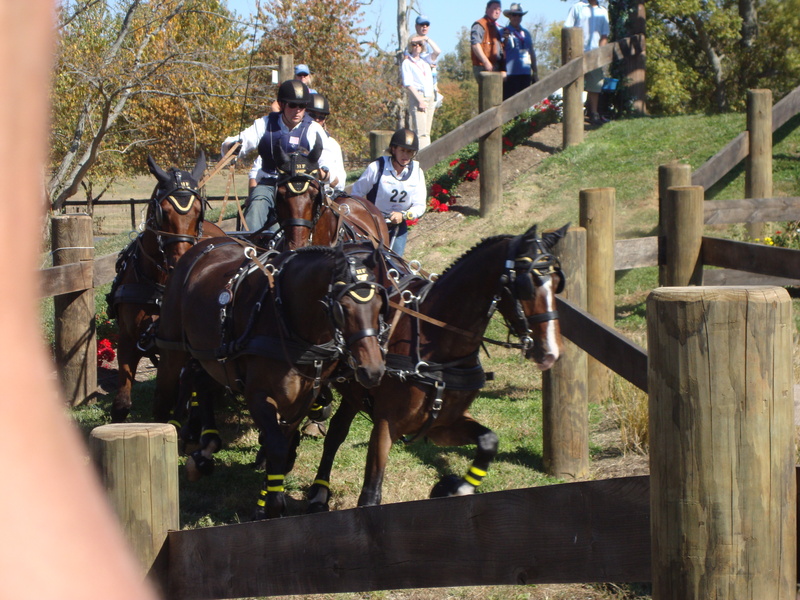 There were no injuries, we hasten to add, to horses or humans (or obstacles). 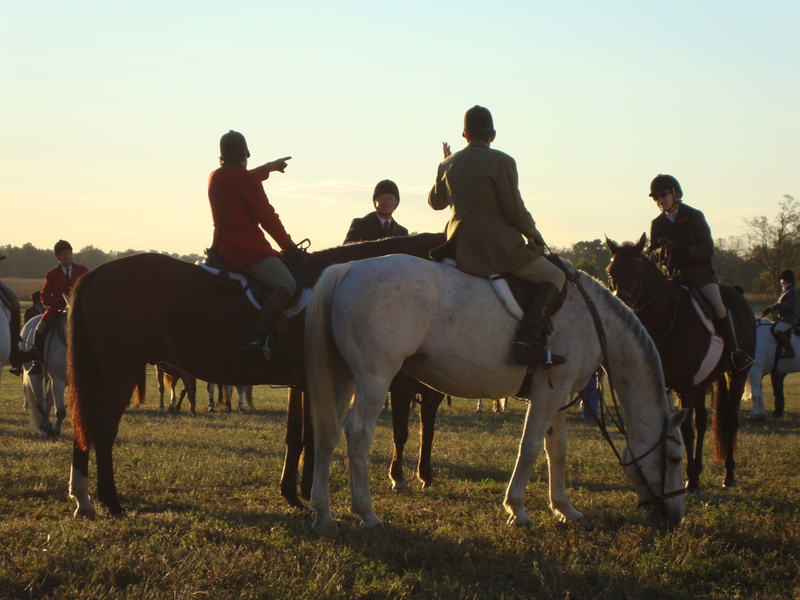 We particularly loved the noises of this competition: the navigators’ voices, the sounds the drivers made to encourage their horses, the squealing brakes, the thud of fast-moving hooves, and the clink and jingle of bits and harnesses. Along with the thrills and chills of good competition, we also witnessed more of the lighter (and sometimes odder) bits of WEGiana. Like the manic-looking and slightly sinister Giant Leek that marked a gap in the hedge between the Spy Coast parking field and the Horse Park. He was an important landmark for those of us who walked from the parking area instead of taking the shuttle. "This way, folks!" says the Scary Leek. The parking lot was packed every day that we visited WEG, and we spotted license plates from nearly every state in the union. But we did see one state name we weren’t familiar with, although we applauded the enthusiasm behind this graffiti. Kentyuky? Still, it looked like they were glad to be here, and we're glad they came! If you’re allergic to horse hair, this fellow might be just the thing for you: a mechanical cutting horse (with calf)! In case you were as curious about that as we were, we’ve included a little video. 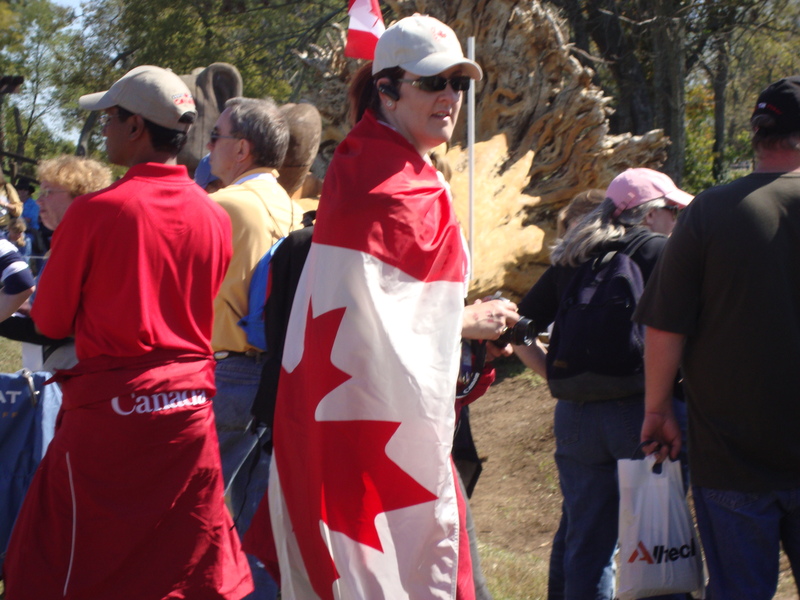 The Canadian contingent was especially boisterous, and they had a lot to cheer about. And remember the stadium jump sproutlets? By Oct. 9, they were all grown up! WEG sparked all sorts of horsey artwork around town. 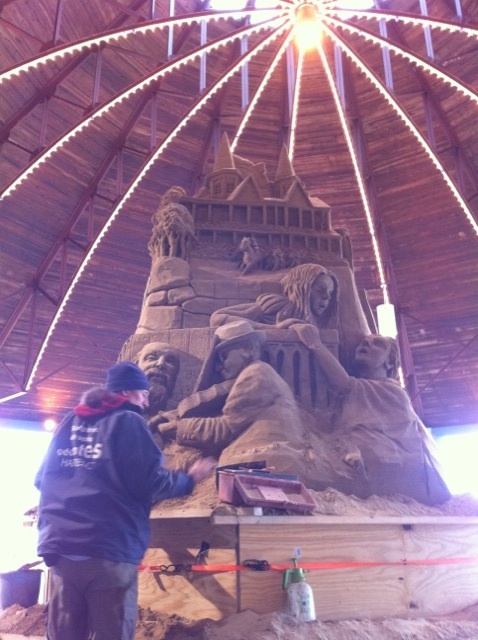 At the Lexington Green shopping center, we saw this huge sand sculpture. 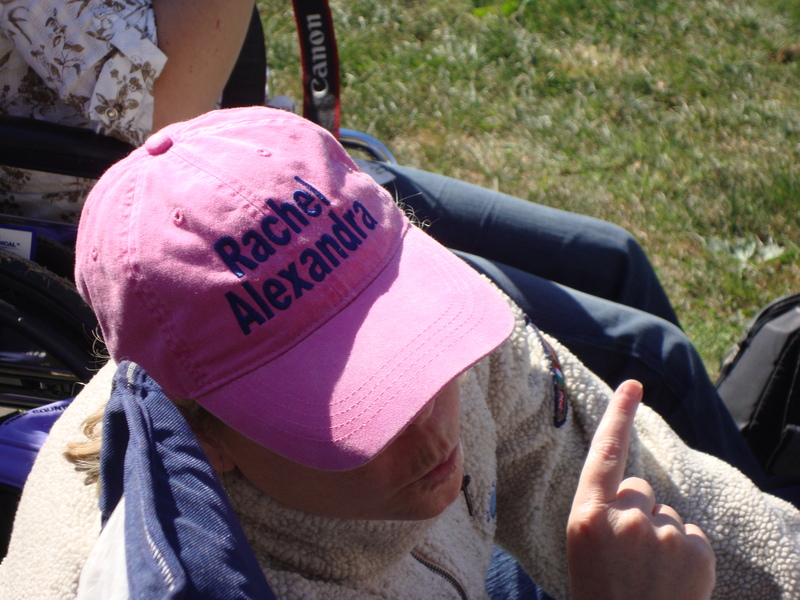 ... and the other side featured a race under the Twin Spires at Churchill Downs. 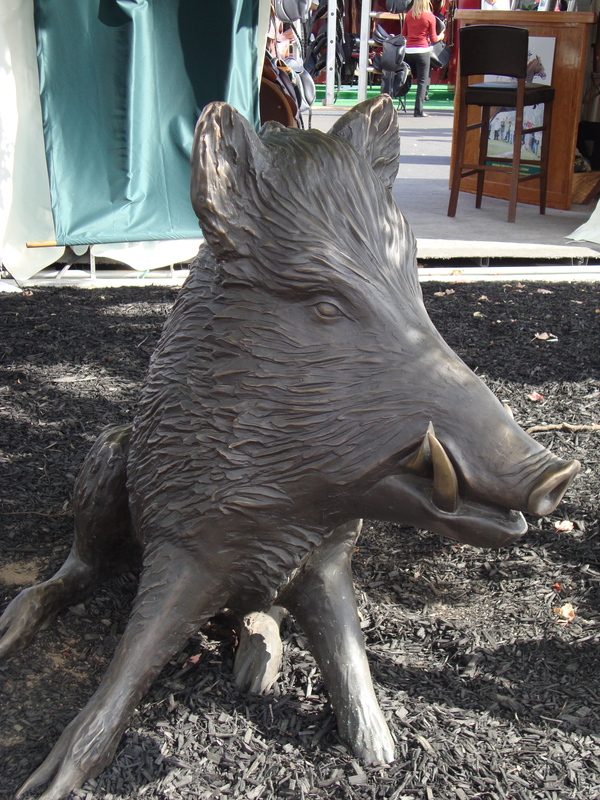 And, finally, there was this charming sculpture. 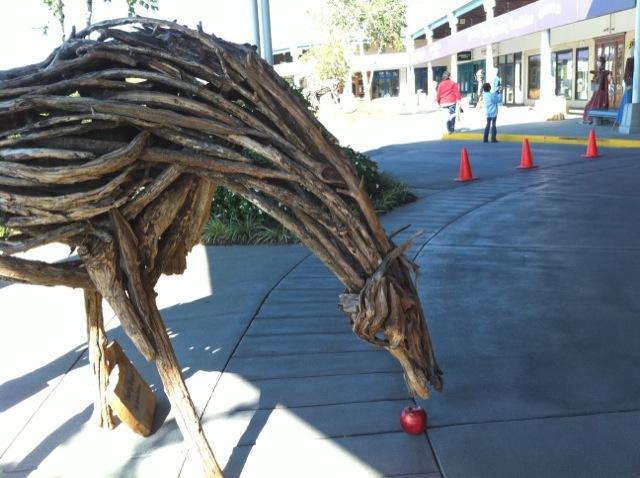 This wooden horse has been on display for several weeks now in front of the entrance to Joseph-Beth Booksellers, and someone thoughtfully keeps replacing his apple. 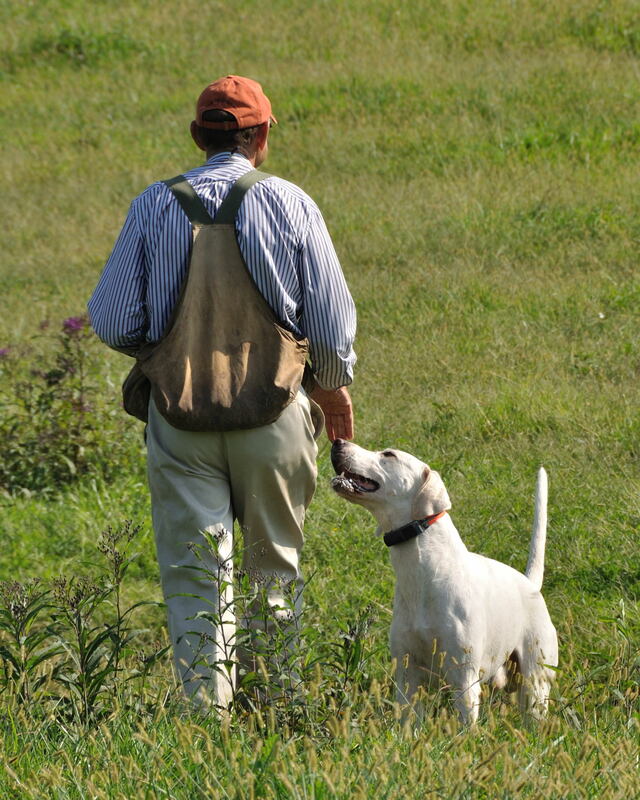 Next up: back to the hunt field with the hounds! Barman and joint-Master Jerry Miller on hound walk in August. WE were deeply saddened to learn today of the death of young Barman ’07, who came to us from the Cottesmore hounds in the spring of 2009. Barman showed great promise but suffered from a significant seizure last year. He lived for a time with the retired hounds while his progress on medication was being monitored, and, not having had a seizure again, he returned to summer walk with the pack this summer. Unfortunately, he was diagnosed with cancer and was put to sleep on Thursday. 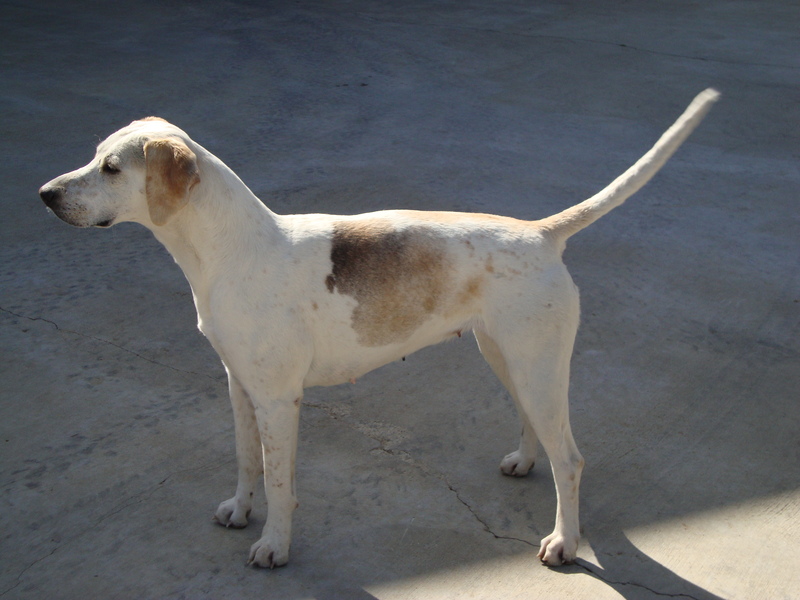 Barman was a handsome, strapping, almost entirely white doghound with a lot of charisma, and the houndbloggers regarded him with special affection. He will be missed, not least by kennel manager Michael Edwards. 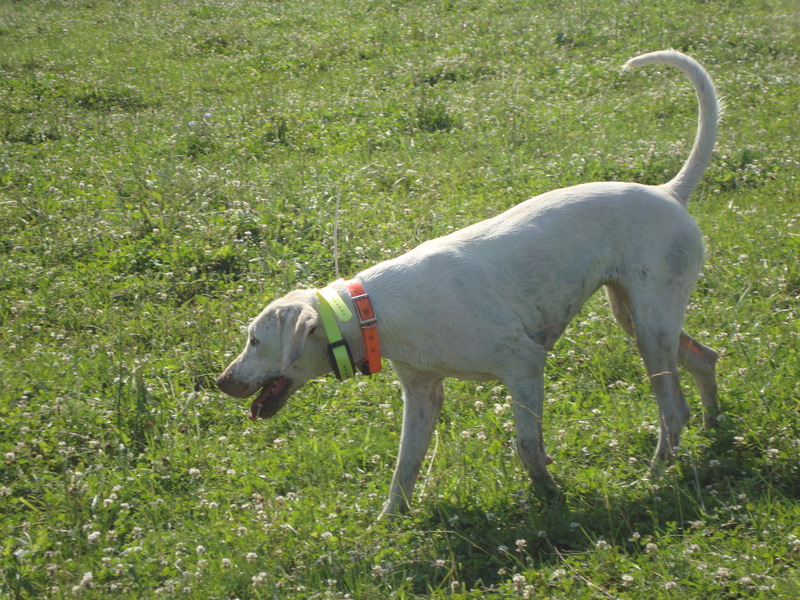 To read more about Barman and his introduction to American hunting, click here and here. You can also see him in this video, taken in January, during his time with the retirees. 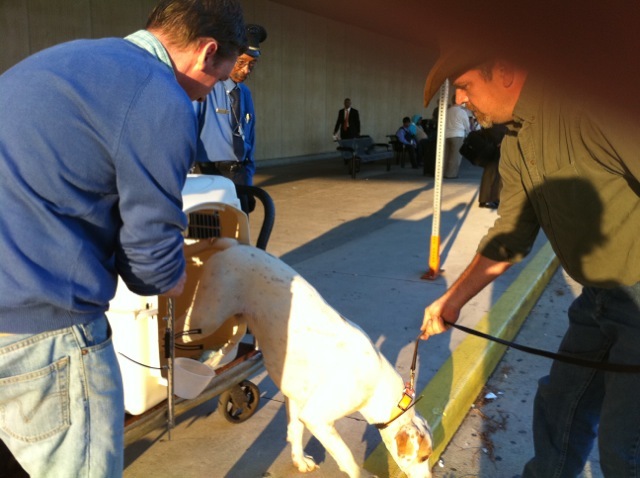 Banker arrives Thursday at the Atlanta airport with a houndblogger to meet Alan Foy. THE houndbloggers brought a wonderful souvenir home from England last week. Meet Banker, age one year and five months, late of the North Cotswold hounds. 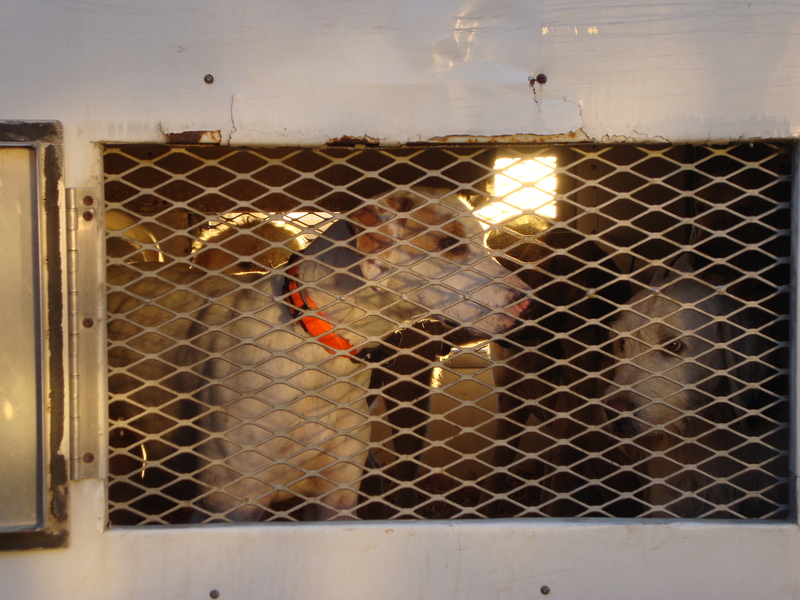 Banker hitched a ride home with us–who could say no to that face?–and will join the Iroquois hunting pack this season. Accompanying hounds by air isn’t that difficult, although it can have some tribulations (see Samson). Fortunately, Banker was an excellent and relaxed traveler, because we did face some delays on the London end. The North Cotswold’s contact, Freddie, dropped him off at about 6 a.m. at our hotel adjacent to the airport. 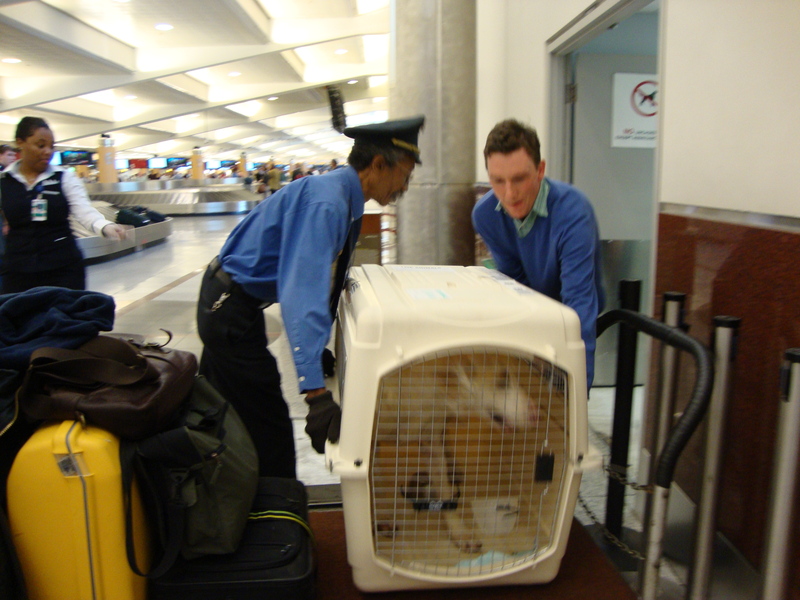 Luckily, most of the airline officials we’ve dealt with when transporting hounds have been very helpful, and we’re fortunate, too, in having good contacts in England to help with any supplies we need to bring a hound over. 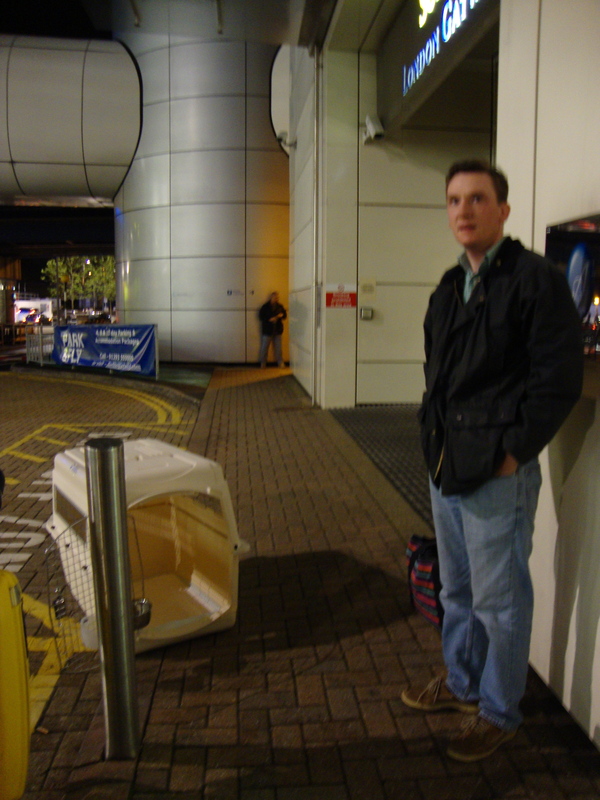 The night before we travel, we scope out our route through the airport and where we’ll park the hound and crate while checking in, all of which helps the process run more efficiently for the hound. What we can’t anticipate, though, are the vagaries of air travel that everyone has to put up with: delays and cancellations. Last week, everything appeared to be running like clockwork. But then … a flight cancellation had us cooling our jets, so to speak, in the airport. There was nothing for it but to wait. 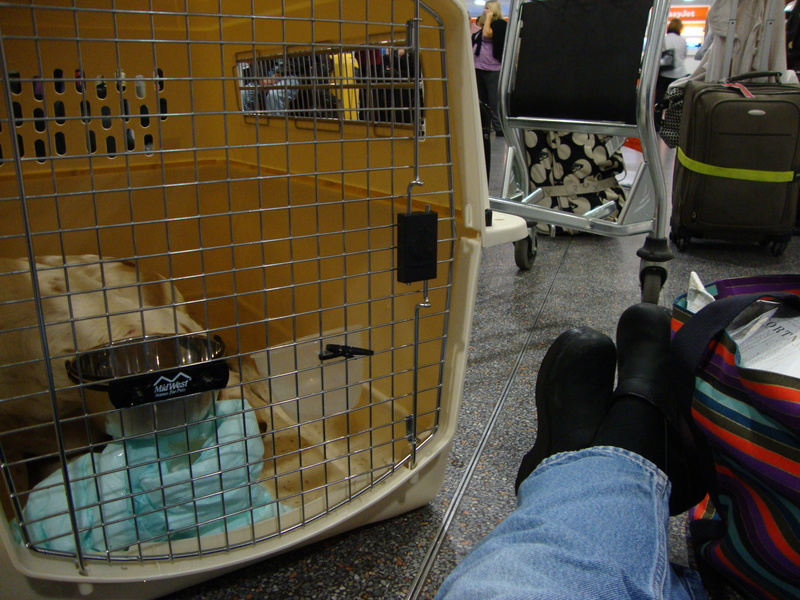 Banker, having spent some time watching all the legs bustle around his crate in the terminal, just curled up and went to sleep. Good dog! 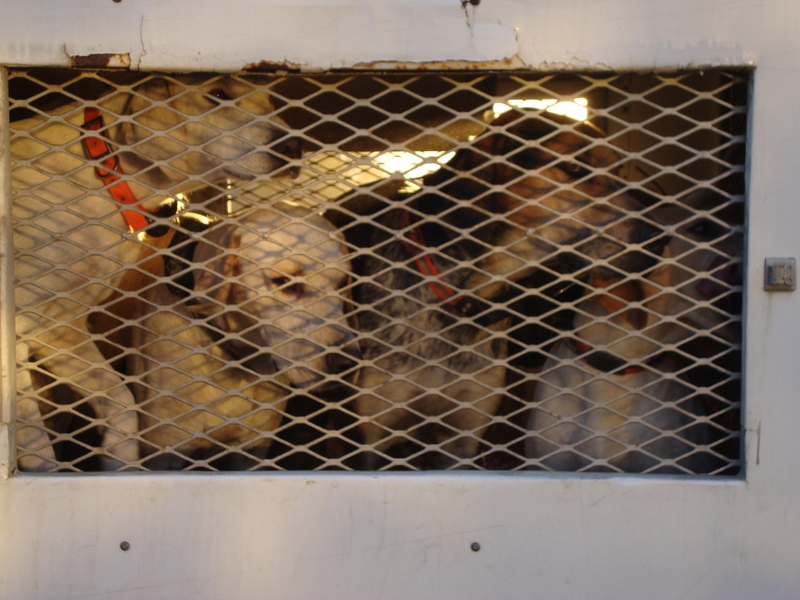 When we finally did get him (and ourselves) loaded on the plane, it was an uneventful–though long–flight to Atlanta, where Alan Foy met us with the hound truck. Banker’s journey wasn’t over, and neither was ours. From Atlanta, it was a six-hour drive back to Lexington. Laid-back Banker didn’t mind a bit. 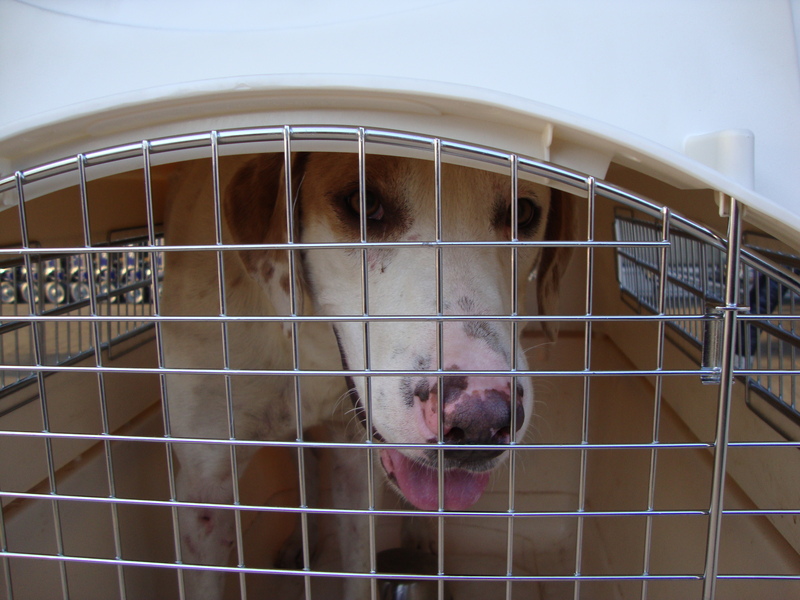 He got some dinner and a bucket of fresh water, and he rode in style in the back of the enormous hound truck, whose bed area has been converted into a large hound box. It’s bedded with lots of warm, dry straw, and Samson happily snoozed, waking up to eat and wag his tail when we made stops. So now we’ll have a Banker and a Banknote (she’s one of the BA litter that will be joining the working pack for the first time this season). 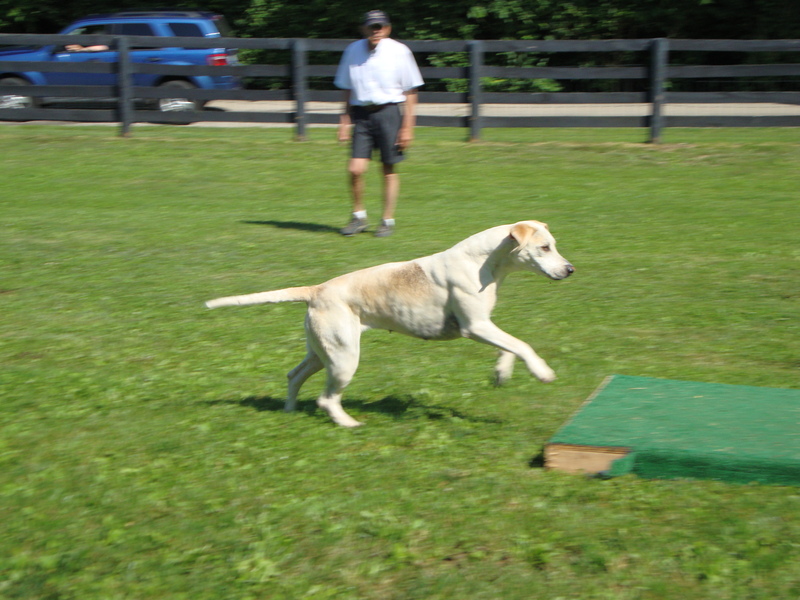 Now, as one of the houndbloggers quipped on a punch-drunk drive home from Atlanta, all we need is a hound named Bailout! 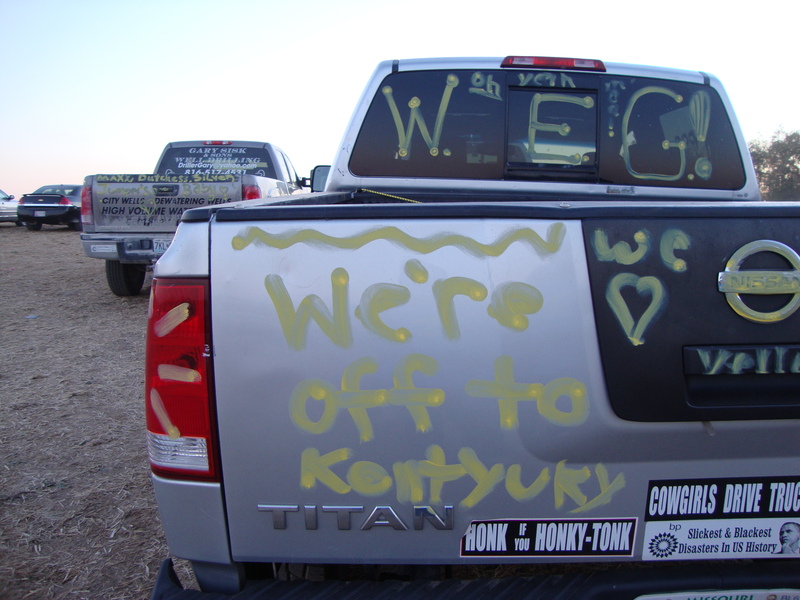 Once back in Lexington, the houndbloggers HAD to check out the World Equestrian Games. 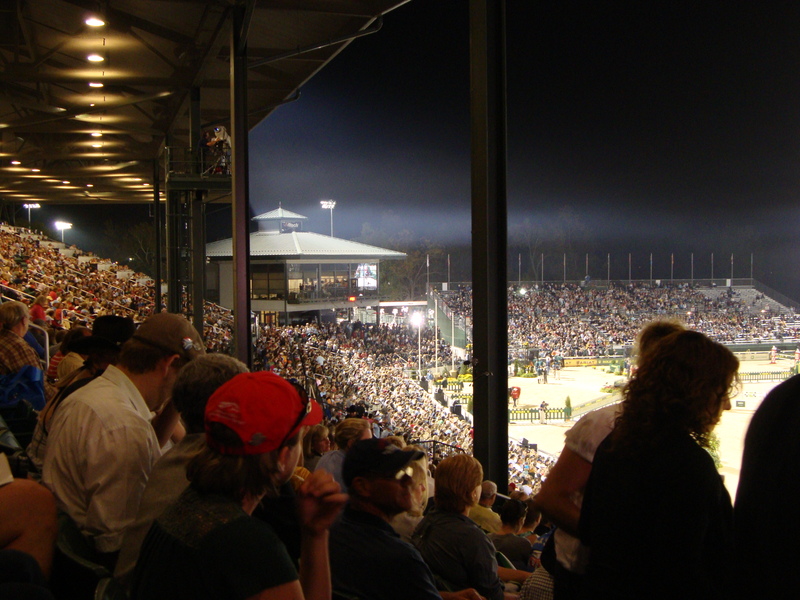 This world championship event takes place every four years and attracts horses and riders from all over the world; this year, it’s being held in North America for the first time. 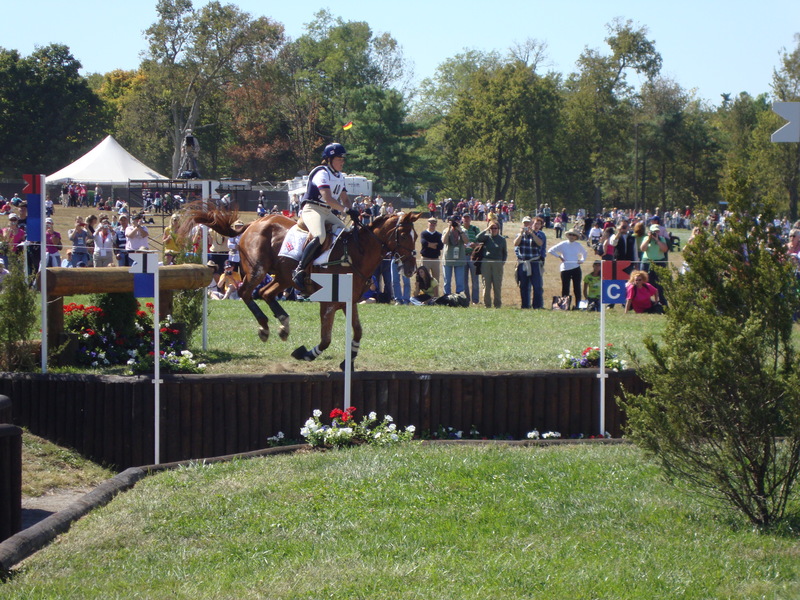 Saturday, Oct. 2, was the cross-country eventing day. We’re big fans of former racehorse, now three-day eventing star Courageous Comet and his rider Becky Holder, and getting to see him compete at WEG was a draw in itself (and we were crushed to learn this morning that, after throwing a shoe early on the cross-country course, third-placed Courageous Comet was withdrawn after Sunday morning’s jog in advance of that day’s stadium jumping competition, the final and deciding part of the eventing competition; to see his outstanding cross-country run, even minus the shoe, click here). 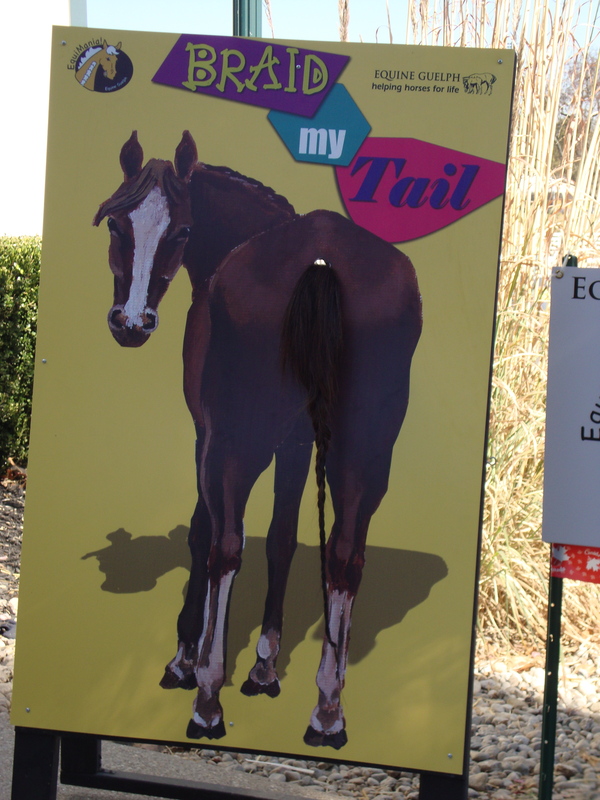 So we trooped out to the Kentucky Horse Park. We’re glad we did. 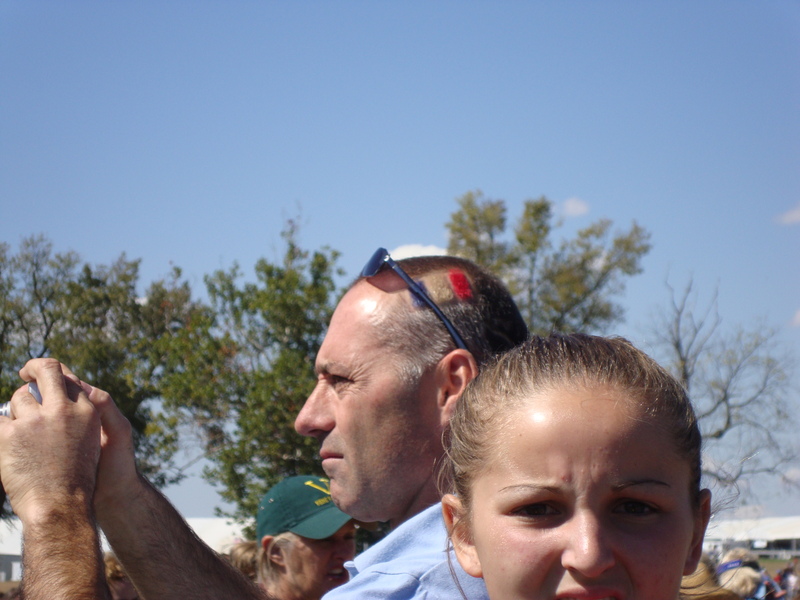 We cheered for Courageous Comet at what Rolex Three-Day Event-goers will know as the Head of the Lake, temporarily named the Land Between the Lakes for WEG. 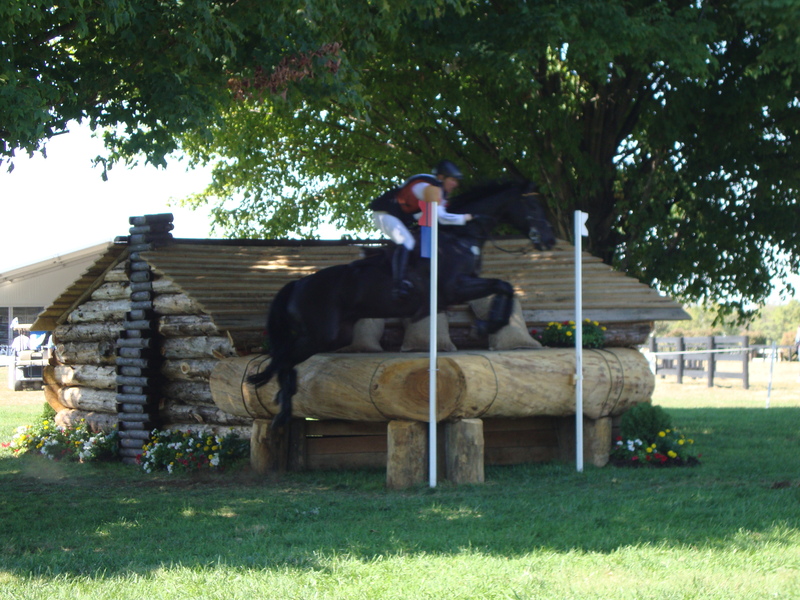 This multi-fence obstacle is probably the prettiest one on the cross-country course, and it drew the biggest crowd. 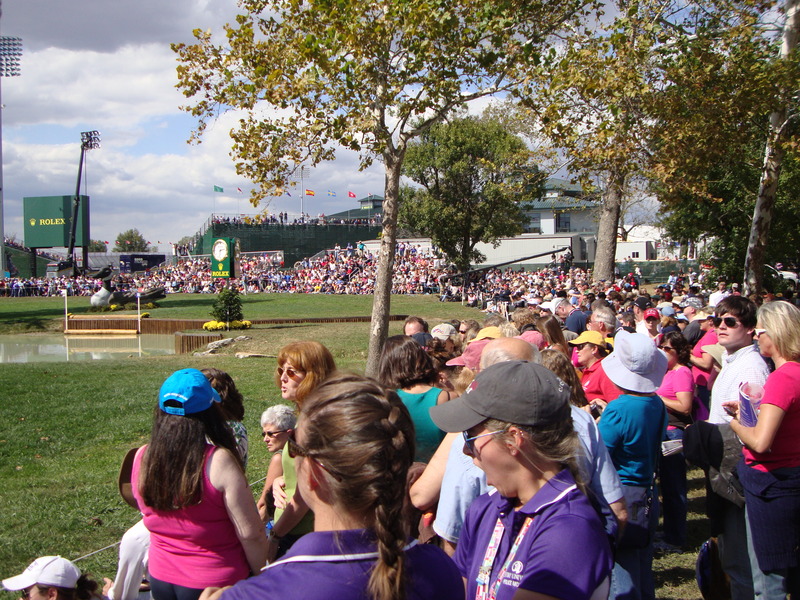 The crowd at WEG's Land Between the Lakes, fence 17. 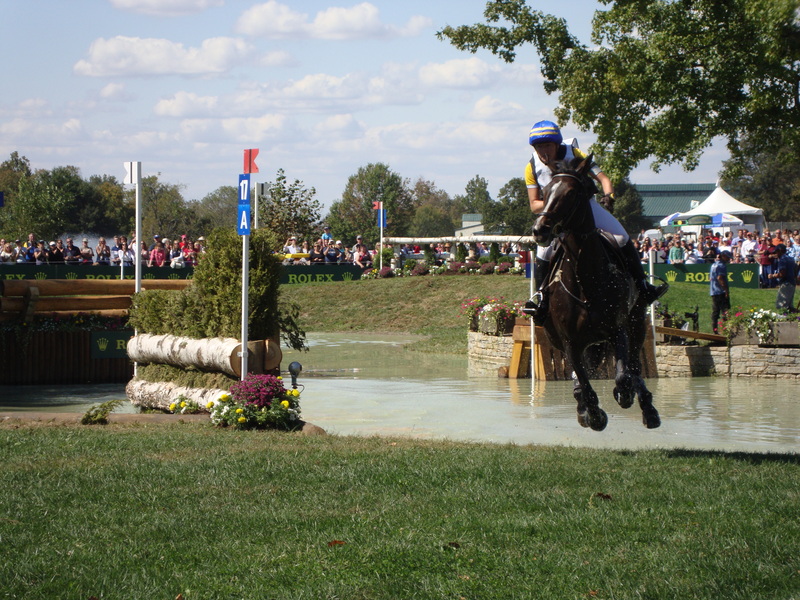 A competitor gallops out of the Land Between the Lakes combination. Okay, that just looks big. … and some of the showjumpers warming up on the flat for the coming week’s competition. 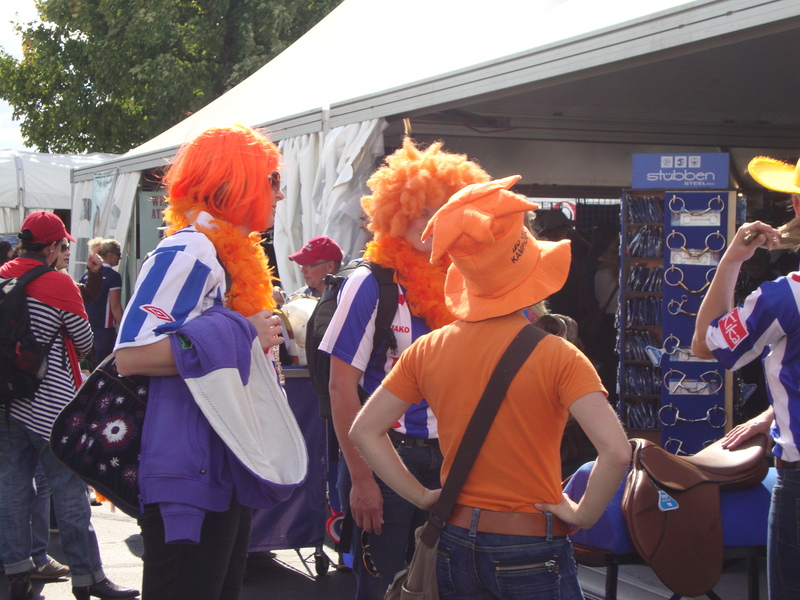 There’s even more to do at the World Equestrian Games than watch the competitions. 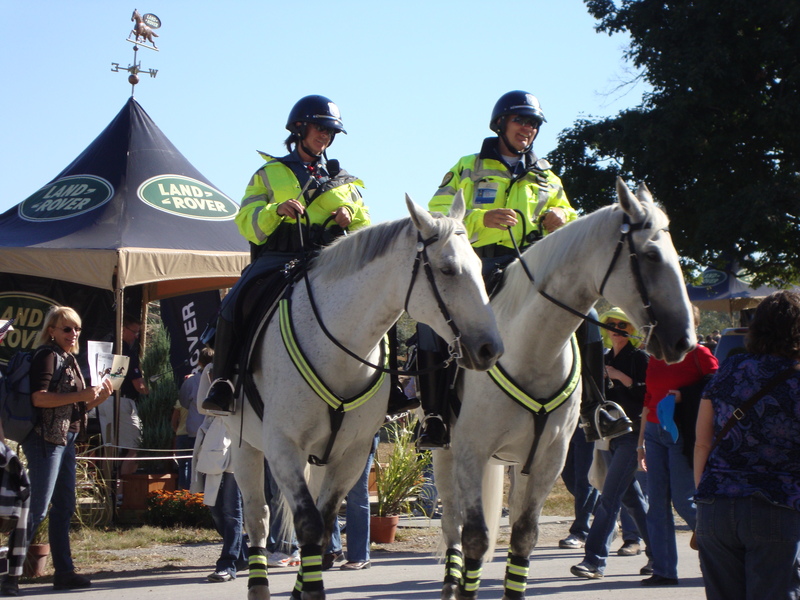 The Equine Village and trade fair feature many exhibitions, demonstrations, and opportunities to shed some cash. 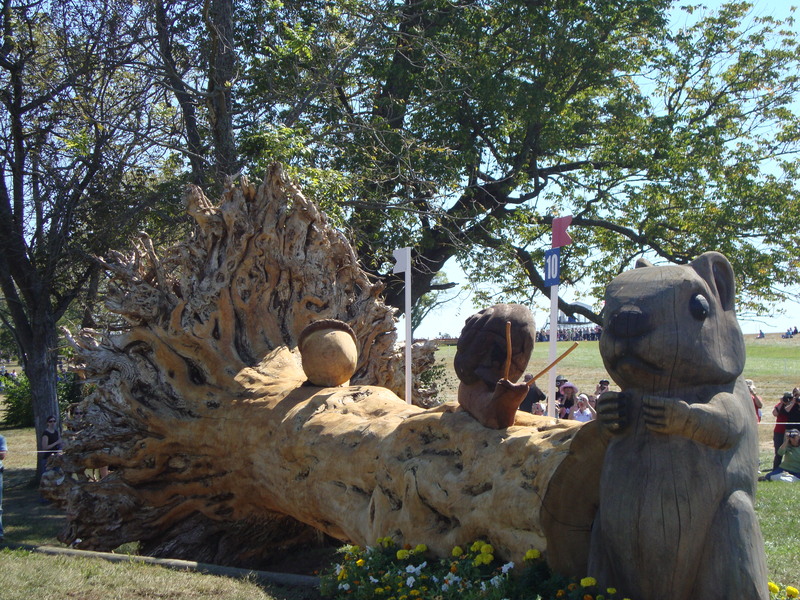 Walking through the various displays, we came upon a few unusual and unexpected sights. 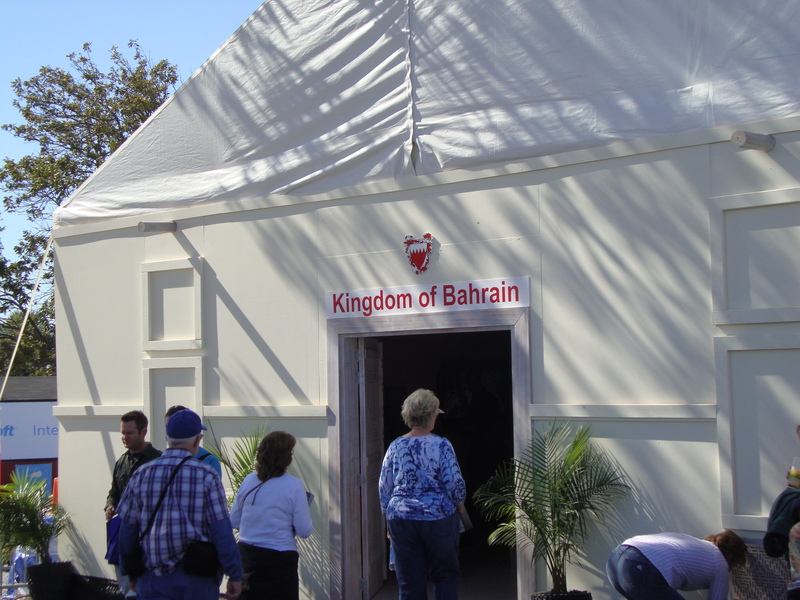 Who knew the Kingdom of Bahrain was so small and portable? 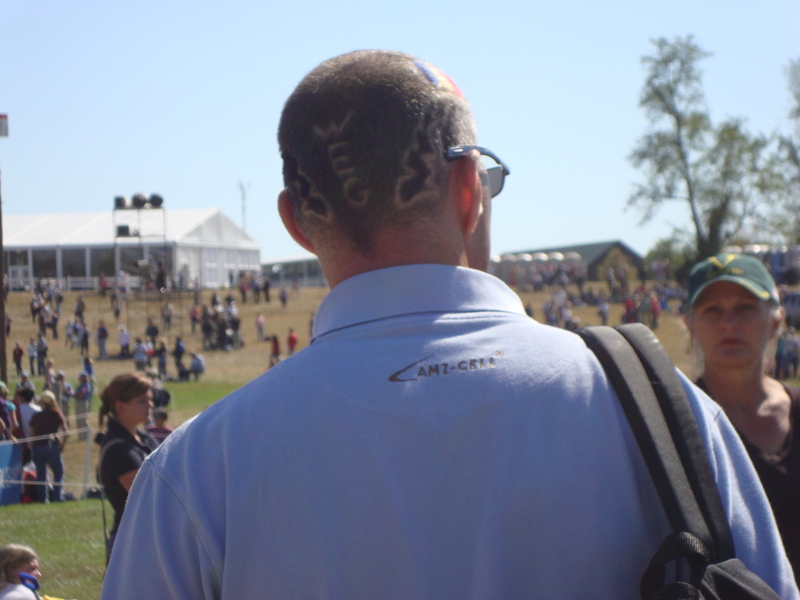 This French fan had a hairy take on the day's events. How did we know he was French? 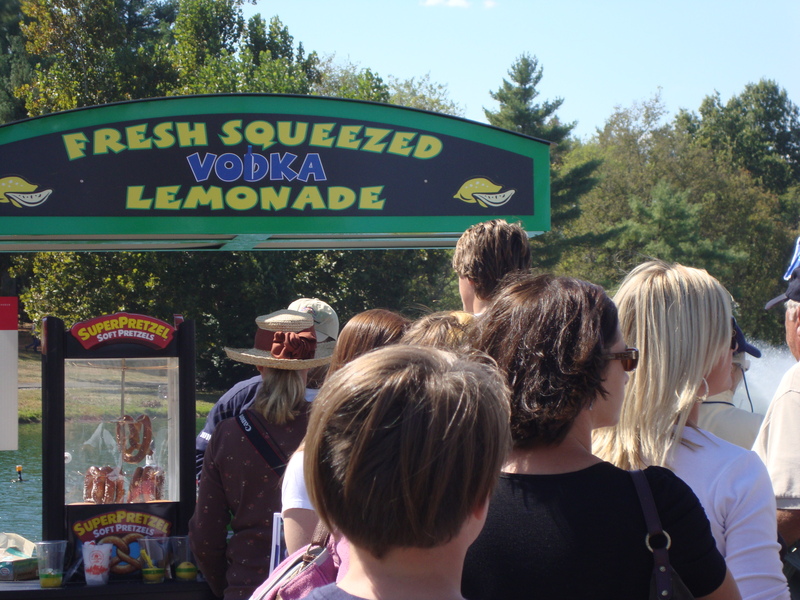 If all the colorful crowds were too much for you, how about a drink? Speaking of dietary staples, there were also these frozen ice cream balls. Officially, they were called Dippin’ Dots, but I like Mr. Houndblogger’s name for them: Weird in a Cup. Styrofoam ice cream, anyone? 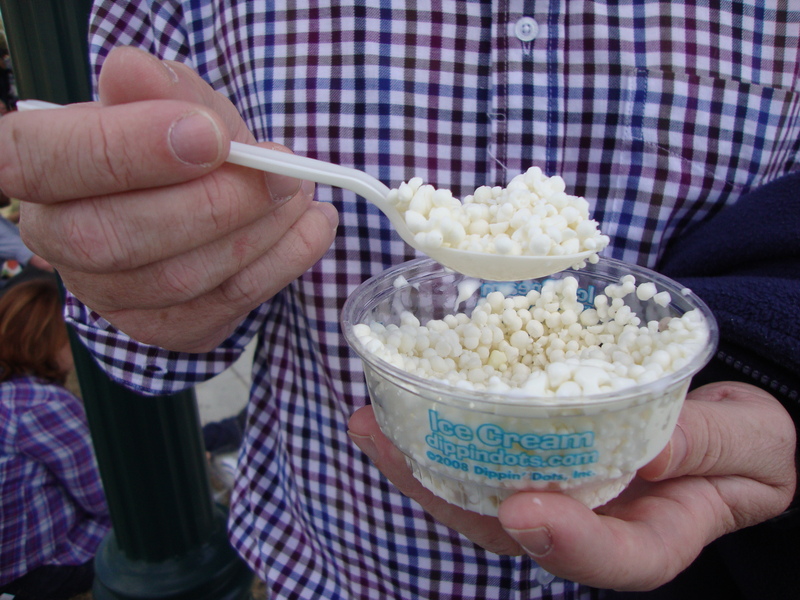 The alarming Dippin' Dots. For the record, the houndbloggers don’t recommend them. The thing we missed most of all? Dogs. 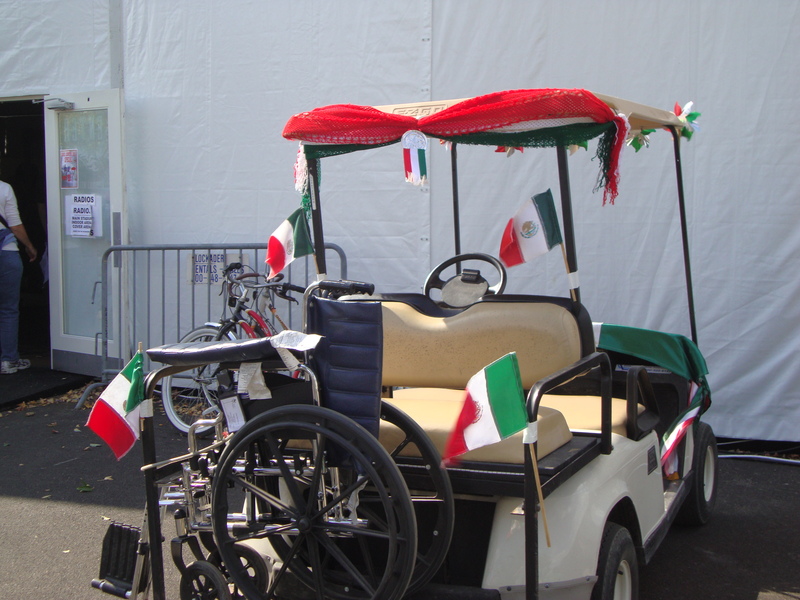 Due to veterinary restrictions, dogs are banned from attending WEG. As we walked around the cross-country course, we noted how strange it seemed to be at the Kentucky Horse Park and not see dogs. 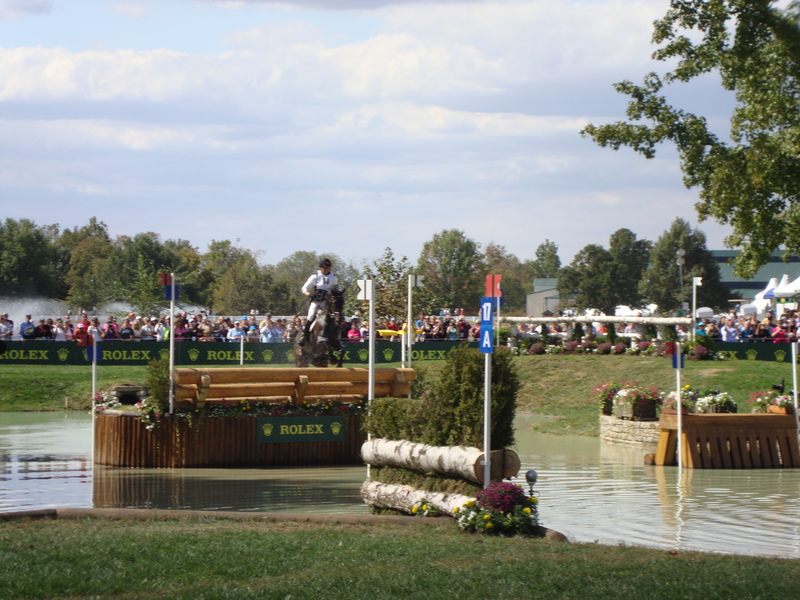 They’re a regular feature, and in fact one of our favorite parts, of the Rolex event. 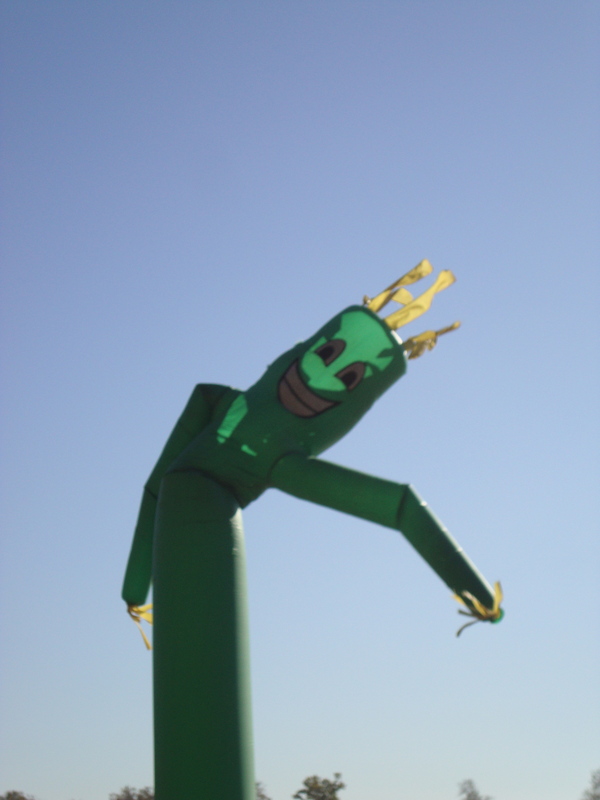 But we did see this guy. I think he thought he was going to be attending the Warthog Eventing Games, poor fellow. At least it looked like he was having fun, anyway!